Las Vegas - The family of billionaire casino mogul and GOP kingmaker Sheldon Adelson revealed that it bought the Las Vegas Review-Journal, ending a week of speculation and demands by staff, media watchdogs and politicians to know the identity of the new boss. A statement printed on page 2 of Thursday’s edition follows the announcement last week that the paper was sold for a second time this year to an unidentified buyer and at a markup, prompting scrutiny about the lack of transparency. The Adelsons say they held back because they didn’t want an announcement to distract from Tuesday’s Republican presidential debate held at the Venetian, the casino-hotel on the Las Vegas Strip that is part of Adelson’s empire. Adelson, a major GOP donor, said at the debate that he had “no personal interest” in owning the paper. The timing of the sale and the purchase price had pundits theorizing that Adelson bought the largest newspaper in a swing state to influence the presidential election. Nevada is fourth in the primary process, with balloting in February. In the 2012 campaign, the Adelson family spent more than any other donor — about $90 million. The case captured the attention of the media and political worlds, as the paper’s own staff took to social media to express frustration and raise transparency and ethical concerns. Ken Doctor, a media analyst, said the previous owner effectively flipped the newspaper for a profit and that its reporters’ own criticism of the deal could have long-term repercussions for the paper. “It undermines the basically credibility and trustworthiness that is part and parcel for the American daily press,” he said. But the company that sold the paper defended the transaction and slammed the media for its coverage. 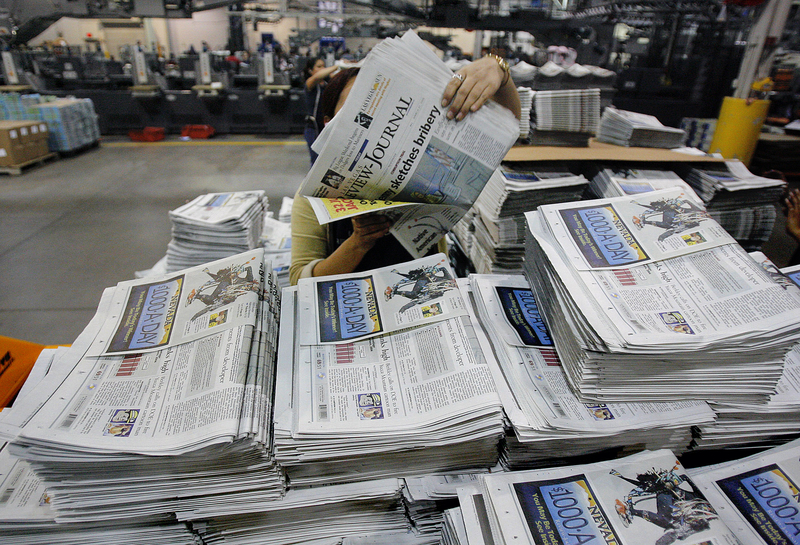 Mike Reed is chief executive officer of New Media Investment Group’s subsidiary company Gatehouse Media, which will continue to run Nevada’s largest newspaper that claims a Sunday circulation of 184,000. He said the public company had no intention to resell the paper, but it did so out of fiduciary duty in the interest of its shareholders when it was made an offer of $140 million. A confidentiality agreement didn’t allow them to disclose who it was doing business with. Reed also rejected the notion that the paper’s integrity had been challenged. He said the public didn’t care about the buyer and that reporters pushed the story with the intention of creating controversy. The paper’s online story about the buyer, however, showed hundreds of reader comments. “I just wish reporters had better hearts and better intentions than just trying to slam media companies trying to do good,” he said. Andrew Seaman, the Society of Professional Journalists’ ethics committee chairman, was unconvinced. “No one has gone through the lengths to keep secrets like this,” Seaman said. Doctor said Adelson’s buy could be a sign of a new kind of newspaper owner: the political buyer. But the idea of a wealthy owner with strong political interests isn’t new, and certainly not in Las Vegas. Brian Greenspun, CEO and publisher of the rival Las Vegas Sun, said there will clearly be some political differences between the two papers, “but that just makes for good reading.” He was once roommates with former President Bill Clinton and has supported Hillary Clinton’s candidacy. He said he welcomes the Adelson family to the journalism neighborhood and that any success under the new ownership would be good for them both. The newspapers have a joint operating agreement, with the Sun delivered alongside the Review-Journal.